Getting where you need to go isn't necessarily easier now that mapping tools are online. Yahoo Maps, for example, always tells me to go around the block just to leave my house. I recently tried DeLorme Publishing Co. Inc.'s Earthmate Road Warrior Edition Global Positioning System with a Palm OS handheld [GCN, June 19, Page 25]. Street Atlas USA came bundled with the GPS program. I liked the GPS application. I'm even more positive about Street Atlas USA. It makes getting around easier. To test it, I requested a route from suburban Washington to rural Georgia. Street Atlas did a perfect job without telling me to round the block when leaving home. Street Atlas USA works with a desktop, notebook or handheld computer to map out routes and points of interest. It even supplies information on road construction. It mapped out a little-known course along back roads that cut a half-hour off the drive time and avoided several clogged cities. The application even noted a small airport close to my destination that turned out to be a private airport with a short dirt strip, which somehow qualified as a runway. Street Atlas linked to the Web and downloaded information about my planned route, including possible construction delays. DeLorme's information seemed up to date, even noting recent construction on Washington's Capital Beltway. The Web link can also check weather data. Street Atlas USA comes on two CD-ROMs. One holds the application, the other the geographic data. The application CD also stores points of interest (POIs) such as restaurants, lodgings, tourist spots, schools, universities, county seats, courts and police stations. POIs load up at installation and can take a hefty chunk of the hard drive. The 303M default installation might not be acceptable to users who lack the newest PCs sporting 40G drives. During installation, the user can specify which category of POIs to include. This filtering is handy if, for example, you want the locations of all U.S. police stations. But filtering'though it reduces the hard drive requirements'exponentially increases the installation time. During one test when I limited the POI selection, installation took almost an hour. I tested the Earthmate GPS app with a handheld computer from Palm Inc. of Santa Clara, Calif., which downloaded specific Street Atlas USA maps. 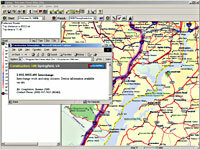 The GPS app also plugs into the serial port of a desktop or notebook PC, which can hold the entire U.S. map without requiring specific map downloads. There's no more need to rent a car with a navigation system. Take Street Atlas USA and the Earthmate with your notebook wherever you go. Don't want the hassle of getting the notebook out and booting up? Print a detailed package of maps and directions. The software offers flexible options for scaling and printing details and elements such as titles or legends. Detailed text directions can also be printed. The application runs rather slowly and prints even more slowly. But when you consider the level of detail and the amount of information you get, such delays are acceptable. I don't agree with some of Street Atlas USA's designations, such as calling Interstate 66 west of Washington a scenic highway. Far west of the city, you do see rolling hills, but mostly there's just lots and lots of traffic on I-66. Nevertheless, Street Atlas USA is an affordable application that can take the place of a large paper atlas or even a vehicle navigation computer.